The picture is terrible, but joey's handmade valentines came out so adorable. The other side of the heart has hand painted and drawn designs by her. we made bees out of pipe cleaners and googly eyes. 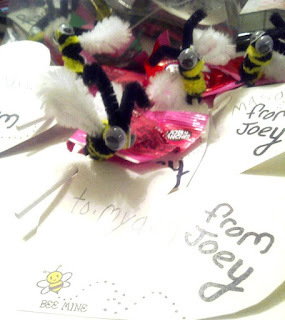 Super easy project "bee mine" from Family Fun magazine. Instead of tissue paper wings we used the bump chennile pipe cleaner cut in half then just add it in as you wind around the striped body part!